Green junior Megan Johnson fires a runner against the Valley defense. Valley’s Mark Merritt talks with his team during a break. 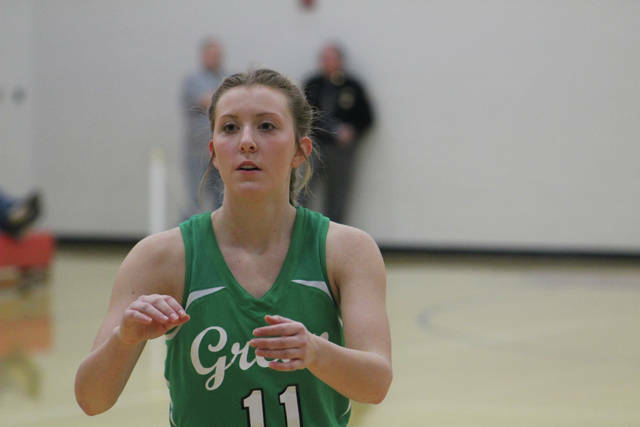 Green senior Leslie Gallion awaits an inbound pass. There is something beautiful about a well-executed full court press in basketball. Five-on-five, double teaming a ball handler in the back court and attempting to steal the ball on your end of the floor. A gamble, sure, but when used properly it can be a dangerous defensive strategy to stall your opponent. Valley head coach Mark Merritt played his cards with the press against Green in the opening round of the sectional tournament on Monday night. 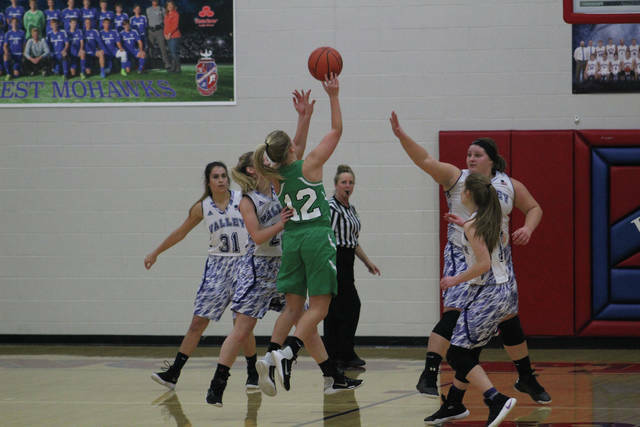 The Lady Indians wound up all in with the chips on the line, advancing to the Division IV Sectional Finals with a 54-17 win over the Lady Bobcats. A big part of that? A relentless swarm of a full court assault that overwhelmed Green early and often. 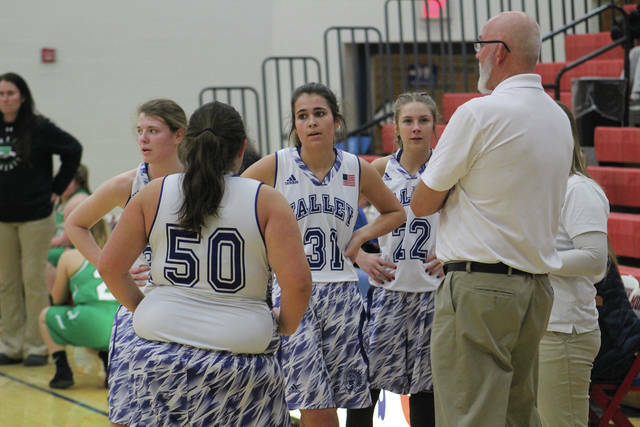 After two Leslie Gallion free throws with 6:04 to play in the first quarter, Valley would go on a 21-0 run in the rest of the period. With multiple steals and great passing on offense, the Indians constantly turned a defensive stop into an offensive score. Valley’s press took the Bobcats out of their offense, coupled with the fact that one of their offensive centerpieces in Kame Sweeney picked up her third foul with 1:45 left in the first quarter. On offense, the Indians worked the ball around and were able to get everyone involved. Kaity Howard set the tone on offense with nine points in the opening frame, and 15 overall to lead all scorers. After one, Valley led 23-2. In the second quarter, the Bobcats were able to battle back a bit by attacking the rim. With 7:26 to play, Green recorded their first made field goal in the game when freshman Charli Blevins fought through contact to make a tough shot in the lane. The Bobcats would make two field goals and four free throws in the period for a total of eight points, their highest scoring eight-minute interval of the game. It was the Indians ahead at the half 36-10. Bre Call had eight points at the break, and 12 on the night. She was able to get open on several instances for uncontested jump shots, and she has shown time and time again that she can make her opponents pay when given the chance. Valley was also pouncing on the glass, especially on offense. It wasn’t unusual for the Indians to get multiple shot attempts on possessions, using their height as an advantage. Merritt also highlighted the play of Chalee Hettinger, who finished with eight rebounds. In the third quarter, Green got a three-pointer from Gallion, who is the only senior on the team. The triple was the only points for the Bobcats in the third quarter. Green would go on to lose the game by a final score of 54-17 after a quick fourth quarter. Knapp had a lot of positive things to say about Gallion in her last game. “She was the mother hen of the team, and with 10 freshman we needed that,” Knapp said. “Leslie is such a leader, she’s going to be a success at whatever she does and that was our big send-off speech with her. Knapp hopes that her team won’t be defeated by the loss, and can grow from it into next year with a young core of players returning. Knapp also cites the return of three juniors next year, who will have to fill Gallion’s void as a leader. However, she doesn’t think that will be a problem for Peyton Gaffney, Megan Johnson, and Aime Laber. With the win, Valley fulfilled one of their goals set in the preseason by besting their win total last year. The Indians are now 6-12 this year, one win better than their 5-18 mark last season. Valley got contributions from nearly the entire roster in the victory, as nine players scored in the game against Green. Merritt hopes that the bench will be able to step up again in the next game for the Indians. Valley will play Notre Dame (22-0) on Thursday, a foe that the Indians head coach says has a lot of options. The Titans defeated Valley 55-25 on January 29, but Merritt hopes his girls can give Notre Dame a fight the second time around.